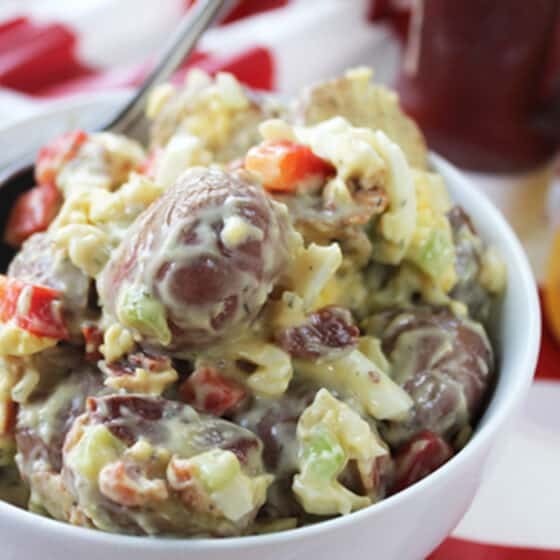 This Roasted Red Potato Salad with bacon takes your potato salad to the next level by roasting the potatoes first. Throw in some bacon, egg, a little dill and you've just created the WOW factor for your next picnic! Cut a big enough piece of heavy duty aluminum foil to fit cut-up potatoes with enough room to fold over and seal. Wash potatoes and cut in half. Place in bowl and toss with enough olive oil to coat, add dill and salt & pepper. Place on foil and fold up to seal. Place packet on grill and cook for 10 minutes per side. Remove from grill and let cool slightly. Empty packet into large bowl and place in refrigerator to chill. While potatoes are roasting, cook bacon and set aside to cool. Cook eggs and let cool slightly then peel. Chop and place in bowl with roasted potatoes. When ingredients have chilled, add salad ingredients and crumbled bacon. Toss to coat well. Store in refrigerator until ready to serve.